It isn't often that a bunch of employers will gather for several hours in a purposeful effort to meet you and other job seekers. So when a career fair is held in your area, it's smart for you to attend. But to get something from the experience beyond a few free key chains, you need to understand what you should do before, during and after the career fair -- and then follow through. 1. Develop a Strong Resume: Highlight your skills and accomplishments. 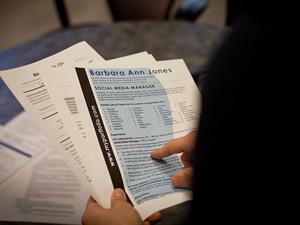 Your resume should be error-free, concise and graphically pleasing. Don't forget to make several copies, since you'll probably visit with more than one employer. 2. Get or Make Business Cards: You can buy blank business cards at stores like Office Depot, and then use a computer and laser printer to create some personalized cards. List your name, contact information, and perhaps the career you'd like to pursue or your key skills. 3. Study the Organizations Attending the Fair: Nothing impresses an employer less than a prospective candidate asking, "So what do you guys do?" Instead, be one of the few attendees who know something about each of the companies. The more informed you are, the more likely you will be positively remembered. 4. Develop a 30-Second Commercial: "Tell me a little about yourself." You're likely to get that invitation from many of the employers at the fair. So spend a little time beforehand figuring out your response. Think of your reply as a 30-second, self-promotional commercial you'll deliver to each employer who asks. 1. Introduce Yourself and Shake Hands: In many ways, a career fair is a test of your social skills. While employers are almost always friendly and outgoing, they'll expect the same of you. If you haven't done much ice breaking before, practice in advance with a career counselor or friend. 2. Dress Appropriately: In most cases, you'll want to dress professionally to attend a career fair. Sometimes business casual is fine, but don't go too casual. When in doubt, overdress. 3. Ask Intelligent Questions: If you've studied up on the organizations, you'll probably have some questions you'd like to ask. Not only will you get some answers, but you'll also show yourself to be someone who does his research. 4. Focus on What You Can Offer: You'll be a refreshing change to most company representatives if you tell them what you can do for them and their organizations instead of asking what they can do for you. 5. Leave Your Resume and Card with Each Representative: Then be sure to grab each representative's card. 1. Take Notes: After the fair concludes, jot down notes about conversations you had with company representatives. If you wait too long, the conversations will start running together in your head, and you'll forget what you said to whom. 2. Follow Up on Promises: If, for example, a company representative expressed interest in looking at your Web site, make sure to email the URL like you said you would. 3. Send Thank-You Notes: Write or email each of the people you met and thank them for their time. Reiterate your interest in the company and your relevant skills and experience. Most job seekers fail to take this simple step, often losing out in the end to those who did express their thanks. There will be few other times in your life when employers will make such a concerted bid to get your attention. So when they participate in a nearby career fair, make the most of the opportunity to present yourself favorably, gather useful information and meet new contacts. Your small investment of time and effort -- before, during and after -- might very well turn into an opportunity you wouldn't have otherwise had.